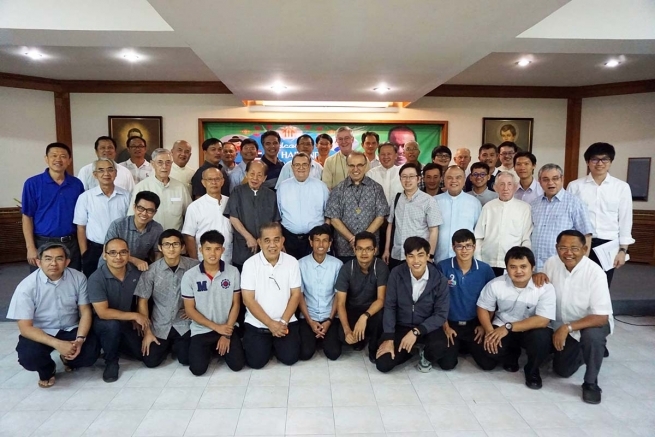 (MissionNewswire) Salesian missionaries working in the province that comprises Thailand, Cambodia and Laos recently wrapped up 10 weeks of collaboration culminating in a two-day meeting and training session that took place at the Bangkok provincial house in Thailand. Both rectors and provincial council members participated in the first part of the meeting with the second day bringing together more than 50 confreres to discuss a vision of continued support and work on behalf of vulnerable youth in the three countries. During the collaboration, Salesian Father Václav Klement, Councilor for the East Asia-Oceania region, met with Salesian missionaries and contacted 10 others who are currently in formation or studying abroad. Father Klement posed the question, “What is the Salesian vision for youth in Thailand, Cambodia and Laos?” to nearly 1,700 teachers and full-time staff in Salesian education programs, parishes, boarding houses and oratories who then had the opportunity to share their vision and suggestions. “There is a very broad field of mission and many human resources needed, especially in the almost 3,000 members of the 10 groups of the Salesian Family across the three countries,” said Fr. Klement. More than 21,000 youth attend educational programs within the three-country province each day. These educational programs include academic schools, vocational training centers, technical schools and boarding houses that provide shelter and residence to more than 1,400 students. During the workshop-style sharing segment of the two-day meeting, rectors and provincial councilors shared insights on their sources of happiness and their comfort zones and how to strengthen a sense of belonging for one province that comprises three countries. The goal is to work collaboratively but also tailor programs to best fit the needs of youth in diverse communities. Because Salesian missionaries live in the communities in which they work, they are especially skilled at creating programs and services that meet the unique needs of specific communities. In Thailand, Salesian programs focus on education and workforce development in partnership with social development services that work to meet the basic needs of youth and their families living in poverty within the country. Nearly 1,000 students attend each of the Salesian Professional Training Centers in Thailand. These centers mostly focus on students who have performed poorly in more traditional schools or have experienced challenges in learning. Those that graduate from the Salesian training courses are typically able to immediately find jobs because the courses are tailored to meet local demand. In an innovative program, Salesian Father Carlo Velardo, the director of the Nonthaburi Skills Development Center for the Blind in Bangkok, trains 40 students with visual impairments through an intensive two-year educational program. When the program first started more than 35 years ago, students were taught trade skills in carpentry and woodworking. Some students were able to find work but many others were denied employment because local employers feared workplace injuries and were put off by the higher costs of insuring visually-impaired employees. As a result, the program changed focus and in 1983 began training its students to become massage therapists. As an acknowledgement of the high-quality training offered and the program’s years of success, the Ministry of Public Health has begun to license graduates as doctors of Thai traditional massage. Most graduates are able to find work immediately and continue to hone their skills for many years. Through the program, the therapists-in-training see more than 150 clients each day.